Please read the instructions below regarding the photos and details we require in advance. We cannot provide an appointment or evaluation without the required information and photos for an adequate analysis. Have you answered the questions above? All info is confidential according to Data Protection Policy. PHOTOS. 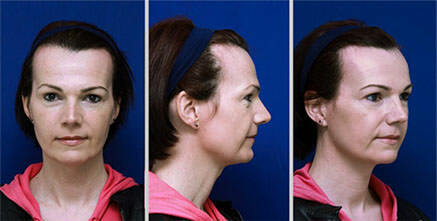 We require 3 photos with your hair pulled back, frontal, profile, and lateral 45 degree angle, as in the examples below. Thank you! Frontal, profile and 3/4 lateral (or 45º), such as in the example below. Camera angle: the camera should be at eye level. Try to keep your head and gaze horizontal. The pictures should be well lit and in focus, but not in direct sunlight. Keep a blank expression, without a smile. Keep your hair tied back so your cheeks and forehead are revealed. Picture size. Up to 1 MB is sufficient. Try to have a blank and neutral color background. It’s fine to wear light make-up, but avoid heavy eyeliner or eye-shadows.